New York musician Jared Robinson aka Folie, has been hard at work to bring everyone his new short LP, Oh, Really?, and if you haven’t listened to his past works, you’re in for a real treat. Folie’s music is filled with interesting melodies and vocals that make every track a whole new experience, it’s a perfect mix of classical instruments and electronic sounds. 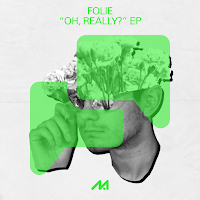 Member of the RORA Team, Folie continues to pursue music that emphasizes the meaning of making music from organic feelings and emotions. Tracks such as "Good Pals," and "Goodnight" intermix thoughtful lyrics and late night jazz rhythms. Below check out this Q&A with Folie to see what inspired this new LP! Enjoy! I think it was around 11ish? I remember my dad downloaded FL Studio on his computer because I didn't have one at the time. I’d have to wait until he wasn't working on it and try to figure out the pretty rough terrain of the FL Studio UI. Eventually, I got my own computer (haha and Ableton). Reggae, Country, Folk, and Comedy Podcast, and some Skrillex? Those are a lot of things I wouldn't describe it as. Actually maybe Skrillex. Do you think your style of production and sound overall has changed in the past few years? Absolutely. 2 years ago I released a future bass track with anime samples, which if you're into is a fun time, but I’d definitely say I've changed a bit since then. When starting a new project, where do you get inspiration from? It's just a lot of the music I love really. Also digging on youtube is a lot of fun. There's just so much stuff that blows me away, music has been happening for so long, and there are a seemingly endless amount of sounds I've never heard before, and that is very exciting. Any future goals or dream collaborations you’d like to mention? It would be really wild if I started releasing just super impractical merch. Like, Folie™ brand Trading cards, or a Folie brand penny presser (for the Folie™ amusement park), or just a normal bible but instead of saying bible on the cover it says “Folie Bible.” Those aren't really any personal goals of mine, though. Working with Bjork is a huge dream for sure.